Kaveri Seeds has announced the commencement of its corn cob drying facility at Molangur in Karimnagar which is Asia’s largest and the first of its kind cob dryer. Kazakhstan to rename country’s capital Astana as Nursultan. NASA to send helicopter to Mars. EU regulators fine Google €1.49 billion. Indian Navy – first Responder to Cyclone ‘IDAI’ in Mozambique. 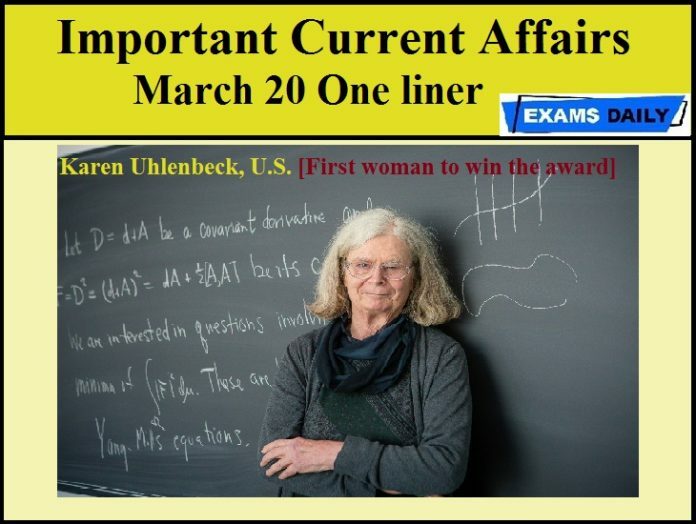 Abel Prize in mathematics – Karen Uhlenbeck of the U.S.